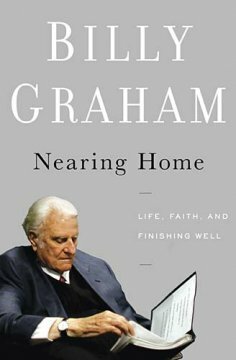 In this narrative, Billy Graham shares his personal experience of growing older and in almost every page of the book, you can see a man who is full of confidence in the Lord. Although he is not a perfect man but rather has his own struggles, yet as you read his narrative, you couldn't help but notice that his deep trust in God is really palpable. In these chapters, he talks about how we should view material riches and money, and how we should view our lives with a sense of mission from God as well as retirement. In the chapter on work, he advises younger people not be slaved to work so much so that our entire self worth are wrapped up in our work. Instead of one who is fear of death, as he nears his last lap of earthly life, again we can see a man who rather embraces death as his days are drawing nearer and nearer home. Others brag, "We've been there and done that!" The truth is that we gain new experiences until we die." In conclusion, this is truly truly a worth account to read, so much gem to pick.